Featuring a content-based, communicative approach to language learning, Cartelera provides a stimulating context for linguistic production through thought-provoking discussion, interpretation, and critical analysis. 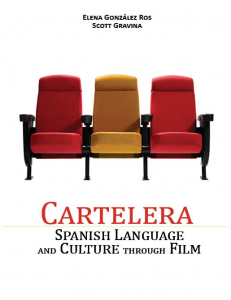 Based on eight full-length feature films from Spain and Latin America, Cartelera builds linguistic proficiency by engaging students in meaningful interactions that cover a broad range of cultural topics taken from the context of the films. Cartelera is designed to be used in an intermediate level language and culture class, with students typically ranging from intermediate low to intermediate high for all skills according to the ACTFL guidelines. The activities in each chapter have been developed to help bridge the gap between the intermediate and advanced levels, providing opportunities to practice and review structures that students are familiar with while challenging them to perform more complex linguistic tasks. Cartelera gives students the tools to successfully improve their language skills, think critically, and react appropriately in order to resolve situations that they would potentially face while living in a Spanish-speaking country. Students will learn to evaluate, question, debate, and express their ideas orally and in a written form. This communicative approach provides the context for students to have significant interactions and reproduce real-life situations in the classroom. Click on the links above for more information about the films. All of the films to accompany Cartelera may be purchased on Amazon.com or your favorite online retailer.